Notice of Default prospecting scrits, Short-sale scripting, and Foreclosure sales script. Prospecting scripts for the Notice of Default, Short-sales and Forclosures. Notice Of Default scripts will get you more listings if you say the right things. They concentrate on the limited amount of time that a homeowner has to list & sell their home. It is a tough but highly lucrative method for getting real estate listings. You will be more successful if you use the scripts for Notice of Defaults. 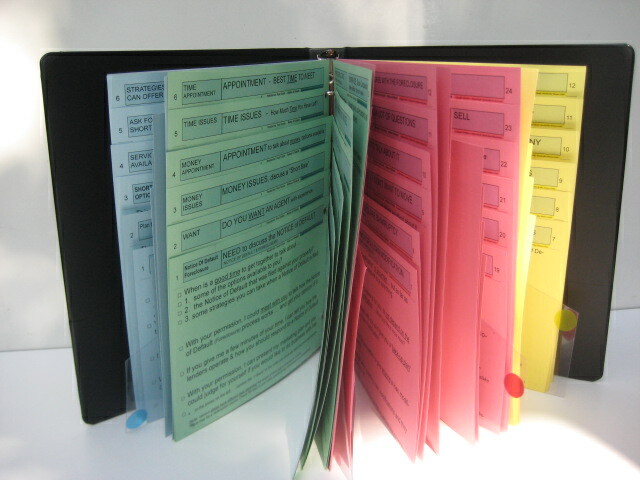 The scripts are all cut-down and assembled. Just stand the script for notice of defaults up in front of you and dial the phone. 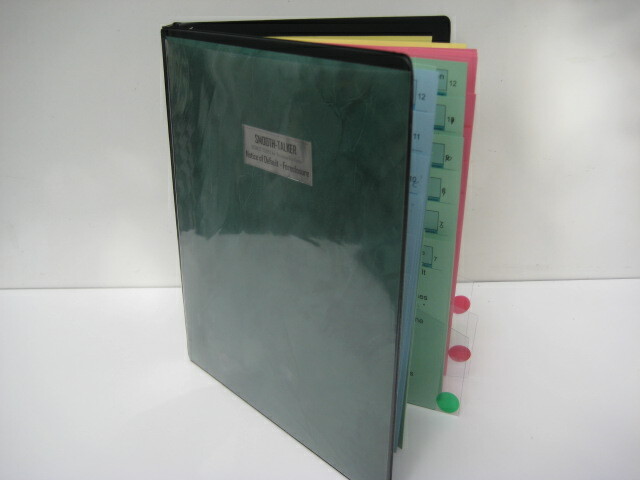 3-ring binder plus 4 plastic section flippers. 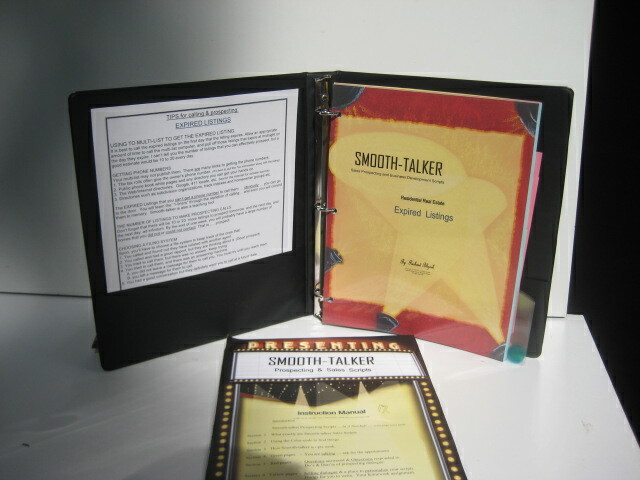 and a Script writing kit to write your own additional scripts. and an up-grade to a Genuine Leather portfolio. "Smooth-talker, How To Write Your Own Sales & Prospecting Script. For a complete list of page headings for Notice of Default / Short-sale / Foreclosure scripts .. go to the bottem of this webpage. An obvious source listings if you're call them. Notice of Defaults prospecting scripts were written because they are an obvious source of listings providing you call them. You are denying yourself success by not establishing yourself as capable of saying the right things to homeowner who has receive a Notice of Default. If you have a Smooth-talkers notice-of-default prospecting script you will have at you fingertips the right things to say and you will get their listing on their home. Foreclosure scripts are for calling on homeowners who've receive a foreclosure notice. Foreclosures will be with us for a long time. - Notice of Default filings & Foreclosure notices are at an all time high. In many markets across the US, nearly 20-30% of the homes are in some stage of the foreclosure process. If Notice of Default filings and Foreclosure notices comprise 20-30 % of your market and you don't call them you're ignoring a sizable portion of real estate leads. If you lack the prospecting skills to call the homeowner who receives a Notice of Default or who may be elgible for Short Sale mortgage reduction, you will remain on the sidelines while others get their business. become a bank owned home. moment and try to sell it but you must stay in contact with them. Therefore .. you have an 60% chance to get an appointment to list the home. You just don't know which of the 60 out of 100 will list their home with you. What do the notice of default script scripts look like? 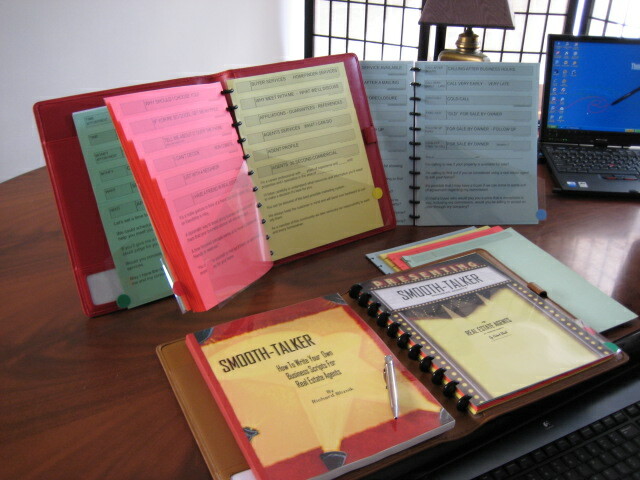 - Each heading page of the script has 5 or 6 "one-liners" that can be simply read aloud to a prospect. The Notice of Default scripts and short-sale scripts have approximately 300 individual lines of dialogue. 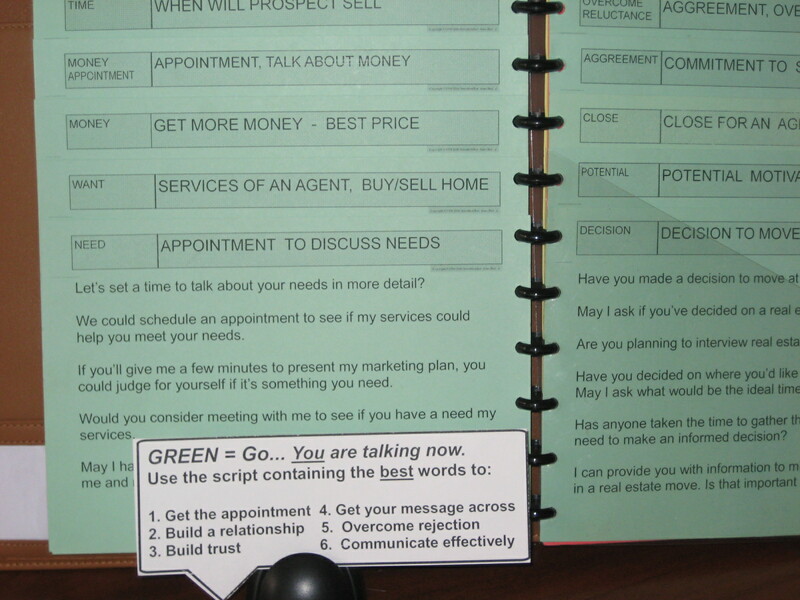 The short-sales scripts are designed for you to easily & quickly flip to a heading page to find a "1-liner" of dialogue. Notice Of Default scripts give you the right words to use. - Having a notice of default script would be like having a magic “teleprompter” appear every time we have something to say. You should know exactly what you're going to say at every step of the prospecting process. Even though there is no such thing as a perfect sales script, a well thought out notice of default script are good enough to get the job done. In time the dialogue will flow smoothly. It all depends on what you say to a homeowner who has received a Notice of Default. - Diplomatically & politely tell the prospect, "If you don't pay, you won't stay." It is just that simple! It all starts with a Notice of Default filing by the lender against the property. After missing at least 3 payments, the bank / lender accelerates the loan by filing a Notice of Default through the county where the property is located. 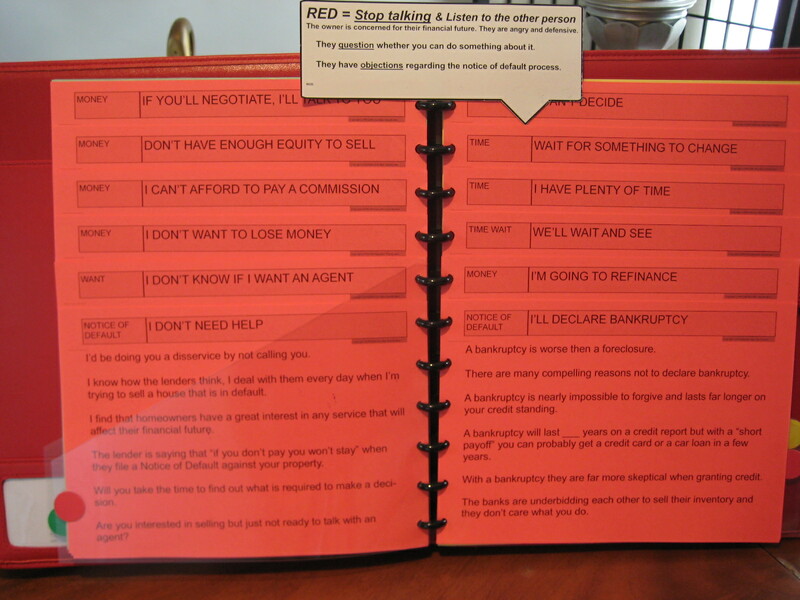 Listings that result from prospecting Notice of Default filings will not come to you, "you" must go to them! If you don't make the call, someone else will. And you won't get the chance to help the prospect by listing their home. Calling the Notice of Defaults filings which may turn into short-sale listing are considered high value targets to get new listings. If you know what to say, you'll have a good chance at getting the listing. Notice of Defaults scripts are the lifeblood of real estate agents. 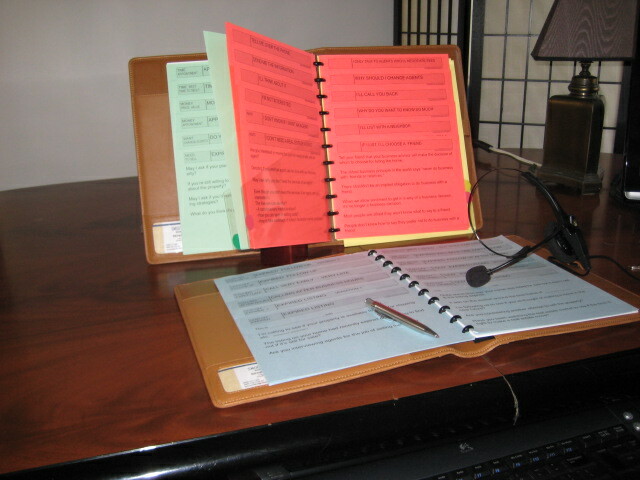 You can can have the ability to talk to them by purchasing our scripts. A certain number of Notice of Defaults and bank foreclosures may find their way to you through other marketing methods but a vast number remain in the hands of the competition. Most people don't mind an ambitious salesperson as long as they are not pushy. It essential to make the calls in order to build a relationship to get the listing. You have to find a way to contact the prospect who has received a Notice of Default filing which may result in a short-sale listing before it goes back to the bank and thus become a bank owned foreclosured home. If you don't prospect the Foreclosure notices, you will get stagnant and lose your edge. Inevitably your listing inventory will go down the longer you are away from prospecting Notice of Default filings. If you don't call the Notice of Default filing and the resulting Short Sale, you can't possibly get the listing. Calling the prospect direct is the best way to reach a homeowner who has received a Notice of Default. Calling the Notice of Defaults filings to obtain a short pay mortgage modification will keep you in business during these tough times. It's an expensive proposition to depend on passive methods to reach Notice of Default filings and the resulting Short-sale loan reduction. Someone must talk to a prospect who receives a Notice of Default to get the business of a homeowner who has received a foreclosure notice. The person who is calling a Notice of Default first, has the best chance to get the listing. You must offer foreclosure assistance to be credible. The closer you are to being that "someone" offering foreclosure assistance and short sale assistance, the more valuable you become. You won’t get all the business but you’ll get your share as long as you try. You should go after whatever is "currently hot" in your marketplace. In some area of the country, the foreclosures are the only viable market. At the present time, it's the most important game in town. In 2017, Notice of Defaults scripts are used to call on at least 10 to 30% of of the homeowners. Right now, it is one of the most important activities for getting listings in the United States. Being successful in real estate depends on a salesperson prospecting by making contact by telephone contact or in person. When a home is foreclosed upon, it becomes a bank owned home and you lose the opportunity to be of service to the homeowner. You must meet the prospect in person. Success rule number-one in prospecting Notice of Defaults is to meet the prospect "in person." It goes without saying that you must talk to the prospect in order for them to do business with you. There's no substitute for getting out and meeting people that receive a Notice of Default filing. It’s easy to fall into the trap of putting things off, thinking that you can make up for lost time by just making more calls tomorrow. Tell the homeowner, "don't give up just yet." The majority of salesperson’s give-up at some point, usually sooner rather then later when it comes to calling on homes in foreclosure. Remember, “Today is that tomorrow that you were going to do so much about yesterday.” When you call on a Notice of Default and are told that your competitor just got their business, you’ll realize how important it is to be persistent. Start when a Notice of Default is filed. You can generally trace the origins of every current customer and account to someone prospecting. Only those who don’t have to prospect for a living have a hard time understanding why you should invest in a product such as a foreclosure prospecting script and a short sale script. Everyone would like to take it easy and coast once in awhile. That's just not possible with a Notice of Default that has a life expectancy of 90 days. Hard as it may sound, prospecting the forclosure notices "now" will provide you with customers in the future. Your future job security rests on the prospecting you do today. Not calling a Notice of Default puts you out of the running for sure. It goes without saying, that if you're out of listings, then you're out of business." The time element for prospecting a Notice of Default is extremely short. The Notice of Default soon becomes a foreclosed home and eventually a bank owned home. And the foreclosure notice of today will be bank owned home in three to six months. Every business has a different period of time that prospects turns into customers. It may be sooner or later, but the time will come when any gap in prospecting will show up because Notice of Default and foreclosures are occurring dailey. Calling on Foreclosure notices are a major source of listings. Notice of Defaults are not going to go away anytime soon. A savy real estate business will always need salespeople who prospect using Notice of Default scripts and Foreclosure scripts. Since 2007, there have never been so many properties that have received a notice of default filing and a foreclosure notice. The "do not call" list. In regards to the "no call" list that has been widely touted as applicable to real estate agents. The prospects have done business with real estate agents before and a business relationship has been established. Prospecting the Foreclosure notices are not like "cold calling." Thus the "Do not call" directory may not apply. The following are the headings & topics of Smooth-talker prospecting scripts for Notice of Defaults. GREEN 24 pages. Means you are Talking & conversing. Usually asking questions. Call to present my services Old prospect, renew interest. 12 pages contain the things that you ask the prospect. You are asking if there is a need for your services?. Request an appointment to discuss the money issues. Do they have the money to pay a commission? Talk about how much time they have to sell the property & ask for a "Short sale." Have they made a decision about who the choose as their real estate agent. Questions to qualify the prospect and gauge the potential for doing business. Words that puts their mind at ease and eliminate sales reluctance. Sympathize .. Dialogue that shows that you understand what they are going through. I’m not interested. I'm thinking of declaring bankruptcy. I don't need any help. It isn't fair. I don't want to move. I don't want an agent. I won't sign anything. My word is my bond. Why do you keep calling me? I don't want to talk about it. You're asking a lot of questions. Drop off the information & I'll look at it. Why do you want to know so much? Send information - Tell me over the phone. A loan remediation service is going to help us. I'm going to refinance. Can't afford to pay a commission. I'll wait for something to change. If you'll negotiate your commission ... I'll talk to you. Waiting for a loan reduction. I have plenty of time. In denial. I don't agree with the foreclosure. Don't want to lose money. I can't decide. Won't make a committment. I don't have enough equity to sell. Our lawyer will advise us. I haven’t made a decision. I want to think about it. 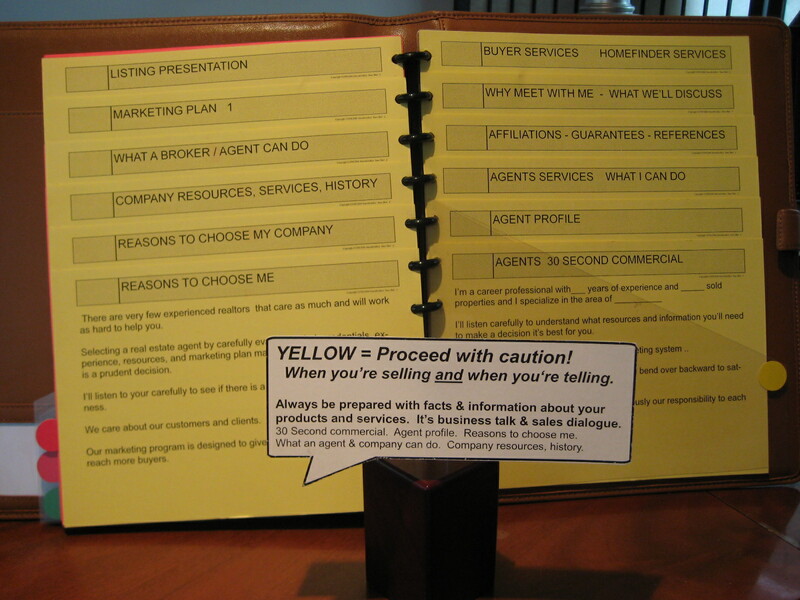 YELLOW 12 pages of the traditional selling language & reasons to do business with you. They are the "Sell & Tell" pages that give the most important selling message. "30-Second Commercial" Agent services regarding a Notice of Default. 3 reasons to choose me. Things an agent can do for you. 3 reasons to choose my company. Company services. - company resources. Countdown to the foreclosure. The amount of time left. Referances - Guarentee policies - Affiliations. Meeting outline. - Things we will discuss. The marketing plan we will use. Notice of default,facts and statistics. Prospecting tips for calling a Notice of Default. Be the first one to call! The key to success in prospecting Notice of Default filings is to obtain the information on the owner & property "immediately" after it is recorded. Try and be the first agent to call them! If at all possible or to stop by and knock on the door. The first to call & get an appointment tends to be the first agent to build the trust neccessary to help the homeowner and convince them that listing the home is in their best interest. Getting the information. It is best to call the Notice of Default on the first day (or as soon as possible) that the notice is filed with the county. Usually there is a lag time that occurs if you are getting the raw data from a Title company or a fee based service that supplies you with Notice of Defaults and Foreclosure notices / filings. You may have to go directly to the county recorders office. If the Title companies and the Commercial Services cannot get you the county recording filing information immediately, you may have to get it yourself. This is a lot of hard work but the results are worth the effort. If it’s hard for you, it’s just as hard for someone else. You will eliminate most of your competition if you go to the county recorders office directly and not rely on those commercial services that promise that you'll get the notice of defaults promptly. How much time is required daily to follow foreclosures? Allow an appropriate amount of time to call the computer multi-listing service that you belong to and check the current listings to see if the property is listed. The property may become an “Expired listing” if it doesn’t get sold. The number of calls to make? I can’t tell you the number of properties that you should prospect, but a good estimate would be in excess of 10 to 20 every day. You may have to go out of your market area to find a sufficient number of Notice of Default filings to maintain a lucrative source of business. Don’t forget that there will be 10 or 20 Notice of Defaults / Foreclosure notices to prospect tomorrow, … and the next day, … and the next day, ad infinitum. By the end of one week you will probably have a large number of homes that you did not or could not contact.